Are you in need of a MOD file converter? Maybe you are on a tight budget and you do not intend spending much on a file conversion software. Never mind, this article reveals five free applications that can be used to convert MOD files effortlessly. You can take advantage of them and achieve your file conversion needs. This is a great MOD conversion tool that converts MOD files easily. It is a great alternative to paid software, offering all the features which the paid software do. Besides conversion, you can also burn your converted files to DVD, convert video files to over a hundred formats and edit your videos easily and faster. Common output format from this video converter is 3D MP4, 3D WMV, 3D AVI, 3D MKV and 3D YouTube video. Convert to a vast range of HD and SD video formats: common HD video format like HD TS, HD MPG, HD WMV, HD MP4, HD MKV, etc; popular SD videos like AVI, MP4, MOV, WMV, MKV, MPG, MPEG, H.264, H.265, and more. Extract audio files from MOD recordings and save them as MP3, WMA, M4A, WAV, APE, FLAC, AAC, AC3, MKA, OGG, AIFF, RA, RAM, MPA. Crop the black edge to full screen, trim unwanted part, rotate sideway videos, and merge several videos into a single one, apply some interesting picture or text watermark to make it more unique and stylish. Step 1: Launch Wondershare Free Video Converter after download and install it successfully. You'll come to the Convert section by default. Click on the Add Files button to select MOD files you want to convert to other formats. Step 2: The added files will be displayed as thumbnail on the interface. Open the drop-down list from the Convert all files to: button and click the Video tab to choose a video format. Step 3: After all settings are done, click on the Convert button to start converting MOD to any format you want. The MOD conversion process will be finished after a few seconds. 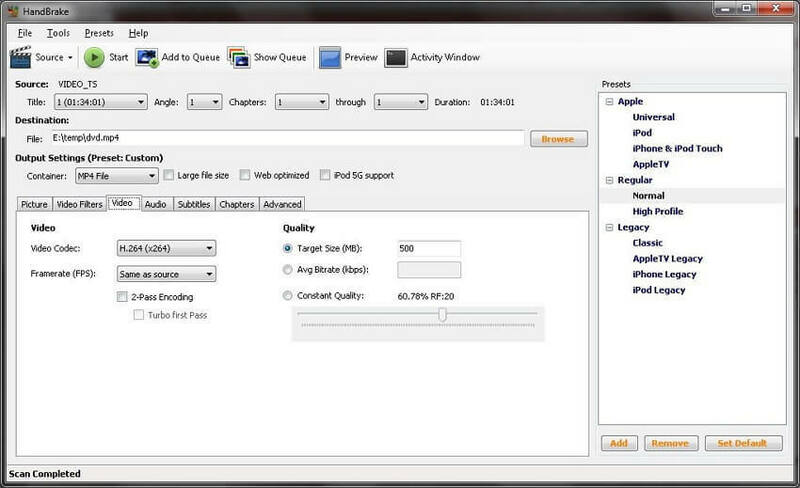 HandBrake is a file conversion tool that is used for the conversion of video files to almost any format, MOD inclusive. It has an interface that is easy to use and master, so end users do not have any problems at all. 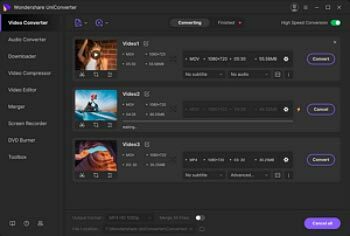 This is a software that was developed to run on all three major operating systems in the market, making it a preferred alternative to paid video converters. Its setup and installation files are made as small as possible, occupying little space in your system. Want to capture your favorite YouTube videos? This program is perfect for taking FLV files and converting them to a more manageable AVI format. The interface is intuitive to use making it easy to operate from the first time you start it up. The program is free of malware which sometimes piggybacks in with free downloads. This is a powerful video converter that has a wide range of file compatibilities. It was developed to run on both Windows and Mac systems. Besides MOD, other file formats include MPEG, VOB, PS, M2P, MOD, VRO, DAT, MOV, DV, AVI, MP4 and TS. This application has other functionalities like editing a file clip, copy paste and trim. It can be used to play movie files format like MPEG and a host of other file formats. It converts, MPEG files between mixed and demuxed formats for the purpose of authoring. It can be used to encode different movie formats. This is a free online file converter that can be used to convert MOD file format. The simple design of this application makes it so easy to use. It is highly recommended for those who always wanted to convert files without downloading a software. Take advantage of this tool today and you will be impressed by its functionality. You no longer have to suffer the inconvenience of not being able to play MOD file format because with these free applications, that is a thing of the past and these tools are great alternatives to paid software. If the MOD converters above can't satisfy your needs well, you can try to use the paid version of MOD converter. 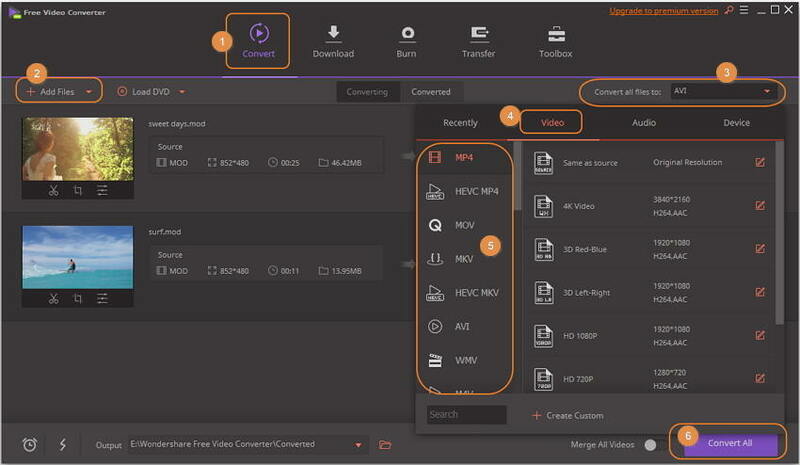 Wondershare UniConverter (originally Wondershare Video Converter Ultimate) is an all-in-one video tool which integrates video converter, downloader, recorder, editor, DVD burner and more. It can convert MOD files to MP4 and other 1000+ video formats without losing quality. You can also edit MOD files with trimming, cropping, rotating, adding watermarks, applying effects, etc. If you want to compress MOD file size to save space, Wondershare UniConverter can also do it for you. This all-in-one video converter works on both Windows and Mac system. Convert MOD videos to 1,000+ formats, like AVI, MKV, MOV, MP4, etc. 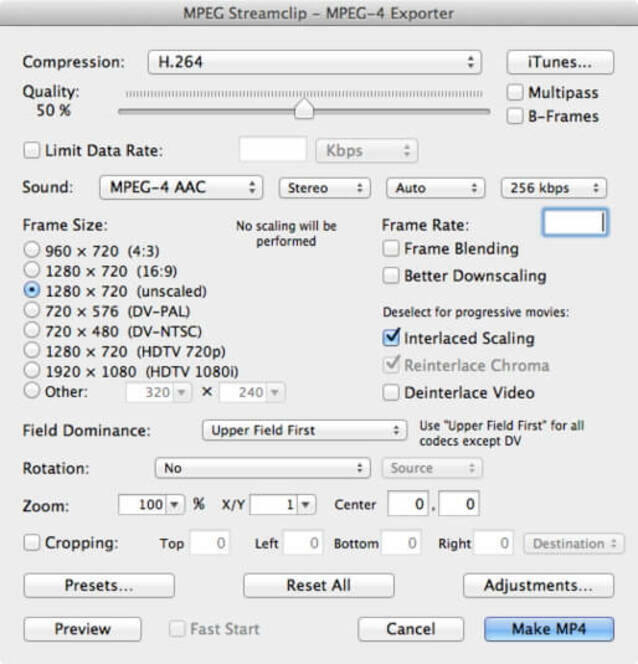 Convert MOD videos to optimized preset for almost all of the devices. Edit, enhance & personalize your MOD videos. Download or record videos from 10,000 video sharing sites like YouTube.